STUDENTS IN NEED—Even before Hurricane Harvey, 70 percent of Spring ISD’s 36,000 student population was already considered economically disadvantaged, making the mini-grant all the more necessary. In August 2017, Hurricane Harvey struck Texas, inflicting $125 billion in economic damage across the southeast and Houston metropolitan areas. One of the many districts impacted by this storm included Spring ISD, located 15 miles north of downtown Houston. 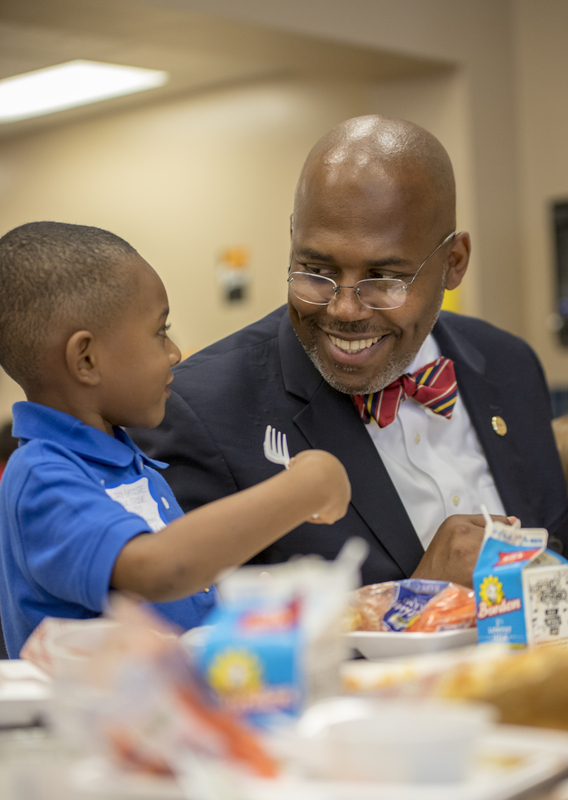 “Because of how much our students, community and staff were affected by the hurricane, we created a team, led by our director of counseling, to look at how we could secure grants to provide support for our district,” says Superintendent Rodney E. Watson of Spring ISD. Almost immediately after Hurricane Harvey, the team at Spring ISD received a notification about the Helping Kids Program from The School Superintendents Association (AASA) and decided to apply. The program is supported by Sourcewell, formerly NJPA, which awards $2,000 grants to districts with students and families in urgent need of assistance. Sourcewell, a government agency that provides cooperative contract purchasing solutions for schools, nonprofits and other government entities nationwide, has helped AASA give districts across the U.S. multiple life-enhancing opportunities through these grants, which can cover clothing, food, shelter and prescription expenses. Watson appreciates that the bulk of the mini-grant’s application process only requires applicants to describe student enrollment and poverty data, the biggest issue affecting their district, and how they plan to use the funding. Schools must also provide a tentative budget. “Sometimes, applying for a grant can take up to 90 days, and if you are doing this in the midst of a crisis, you want a quick and easy process because people are suffering,” says Watson. The Helping Kids Program also didn’t force Spring ISD to use the funding in a prescribed way. “This grant was important because it allowed us to determine how we wanted to meet our goal of supporting families and students who had experienced trauma caused by Hurricane Harvey,” says Watson. Once AASA and Sourcewell awarded the grant to Spring ISD, the district purchased care bags for 1,200 students to help facilitate their emotional recovery. “We had already created a detailed list of every individual who had been affected, so we used that data to provide specific support to those who needed it most,” says Watson. Each bag contained items such as stuffed animals, toys and journals. Students also received a book on how to heal after the hurricane. “Many of our students have said that they took many things for granted before Harvey, including having a home library and books, so they were extremely appreciative of these packages,” says Watson.